Djalma - "m/m/e" / Orphan Sound System - "Layered Seed Water"
These CD's are different projects lead by New York City-based musician Jeff Gburek. Both are improvisational explorations into sound, noise, and efx, but each, though similar, has a different approach. If I had to sum up Djalma I'd call it avant garde Middle Eastern psychedelia. There are two tracks on this 60 minute disc that utilize an impressive list of less than common stringed instruments, winds, horns, and whistles (see back cover scan at right to read the list). The first track is a 45 minute journey that blends trippy Eastern psych, and a parade of found sounds and off-kilter percussion. The music segues quite smoothly from flowing psych to more experimental Henry Cow-like sequences. Of course this is all very freeform though it sounds surprisingly controlled most of the time. The music is actually more on the avant improvisational side, though I don't think I've ever heard dissonance sound so trippy before. I'm not sure if this was the intention or not but that's the way my ears perceive it. Some of my favorite parts are the playful moments when the horns, strings and percussion are dancing about manically in a way that is tribal and enjoyably strange. Some listeners will likely feel the track doesn't justify it's 45 minute length but I grooved along the whole time. The second track is more overtly psychedelic, though deliberately noisey and atmospheric. It's still avant improvisational but the sitar is the lead instrumental and there's more ambient synth work accompanying it. At times it brought to mind Sun Ra jamming with the Maharishi. The Layered Seed Water CD features an avant noise power trio of Jeff Gburek on guitars, violin, mandolin, flute and electronics, John Elmanahi on guitars, mandolin, and efx, and John Palumbo on drums, percussion, and efx. Gburek and Elmanahi seem determined to wrench every brain crunching sound and effect imaginable from their instruments and together create a sonic assault that is notable for the clarity of each instrument, as opposed to being the glomed together wall of sound variety that I don't typically care for. There's lots of great rumbling and crunching, but oh so cosmic, noise guitars and electronics. 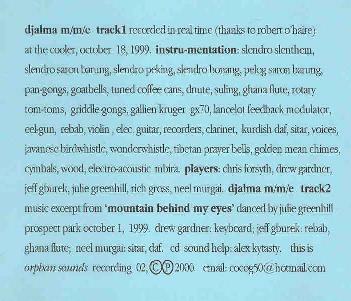 Tracks like "Dangling Corpuscle" are much more minimalist, though it includes enjoyably freaky guitars and electronics. Among my favorites is "Four Seconds Of Giraffe", which features dueling noise guitars. The music develops slowly with the guitars slashing about, the drums setting an ever changing pace, and just enough electronic mayhem to add the finishing touch. On "Ax Or Ox" the duel gets downright ferocious with its sonic guitar freakout of noise, whines, and feedback assaulting the listener's senses. Like Hendrix meets Sonic Youth. In summary, Gburek's music would appeal to psych fans who also enjoy the most freeform of improvisational music, and also like a good bit of chaos and dissonance.